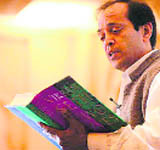 I had assumed that Vikram Seth was a Punjabi: most talented Indians came from the land of five rivers. He put me right. “No, I am not from the Punjab,” he said firmly, “I am from Uttar Pradesh and proud of it”. So I said to him, “No matter where you were born. I regard you as the Koh-i-Noor of Indian writers of English”. He was inclined to agree with me and gave me a copy of “The Golden Gate” which put him on the map of English world of letters. He also gave me another anthology: “Beastly Tales from Here and There” (Puffin Books), which I assumed was his latest publication. But my granddaughter Naina put me right. She told me this was an old book first published in 1992. I retorted, “No matter when it was first published. Vikram is immortal; he has conquered death”. Many people will be willing to believe any canard if they respect the individual who is making the claim. That is why parliamentarians and those in positions of power are advised to be extra careful about what they say and do. We live in a world of conspiracy theories. Apart from the fact that almost everything we do wrong is always due to someone else (wonder who Home Minister Sushilkumar Shinde is going to blame for reading his own speech out twice; Pakistan? ), there are plenty of gullible people who, unfortunately, are willing to believe anything. And the problem is that many otherwise sensible people are unable to distinguish fact from fallacy. Being left-handed, Dhawan has the elegance of Sourav Ganguly but combines it with the aggression of Virender Sehwag. Apart from style, Dhawan had attitude — twirling his moustache like a duellist before gunning down the opposition. I had gone out of curiosity to see the ongoing third Test match between India and Australia at Mohali on Saturday. I timed it so that when I arrived India would be batting. I had secretly hoped to watch the great Sachin Tendulkar bat. Years ago, when I used to write on cricket, Sunil Gavaskar was one batsman I would travel miles to watch. That loyalty shifted to Tendulkar after Gavaskar retired from Test cricket in 1987. I had the privilege of covering matches when Tendulkar emerged as a phenomenon that saw him inherit the mantle of being cricket’s ‘Little Master’ that Gavaskar had worn for so long. One day a mosquito flew/ Through the window. As he drew/ Closer to the velvet bed/ Canopied with gold, he said: ‘Lovely! Just the place for me/ Ah, what perfume - let me see - Rose - no, jasmine./ And the quilt - Smooth as banks of Ganges silt!/ Let me test the bed-springs now’./ So he jumped up - and somehow,/ In a parabolic leap,/ Landed not too far from Creep./ ‘Sir Mosquito, flap your wings./ Leave at once, This bed’s the King’s’./ ‘Who may you be, Lady Louse?’/ ‘I am the guardian of this house’./ ‘House?’ ‘This quilt. It’s mine’, said Creep,/ ‘There’s no place for you, Sir Leap’./ ‘Let me sleep here for one night/ And I’ll catch the morning flight’./ Thus the sad mosquito pleaded,/ And at last his prayers were heeded/ For the tender-hearted Creep/ Could not bear to watch him weep. What is common between Valentine and Palestine? Opinion about both is deeply divided. Guess what greetings the ENT doctor sent to his patients on New Year Day? Guess which slogan hit headlines when Phoolan Devi stood for Lok Sabha? What do women tell men on attaining menopause? What does ‘saali’ mean for men? What does LBW stand for? At an airport, a husband went to receive his wife who was returning from a foreign trip. Finding her husband quiet, the lady pointed to a couple nearby who were smiling and enjoying themselves while he was sad and silent. Breaking his silence, the husband retorted that he had come to receive her and the other guy had come to see her off. 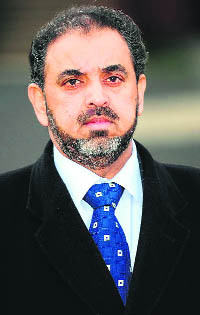 Lord Ahmed, who was suspended from the Labour Party over an interview. Recently, in the UK, Lord Ahmed, the first British Pakistani Muslim peer to be appointed to the upper chamber, was suspended from the Labour Party over an interview he gave in Pakistan last year, in which he alleged a Jewish conspiracy to put him behind bars. Lord Ahmed had been given a three-month jail sentence for dangerous driving because he was sending and receiving text messages minutes before crashing into a stationary vehicle at Sheffield. One man was killed in that accident. But in a television interview in Pakistan, Lord Ahmed said he might have been let off very lightly, and had been imprisoned only due to pressure from Jewish owners of newspapers and TV channels since he had supported the Palestinian cause in Gaza. His claim has created a furore in the UK where anti-Semitic remarks are illegal - made more extreme by the fact that the Labour Party’s own leadership is of Jewish descent and the party also does not allow any room for anti-Semitism. Ed Miliband, the party leader, has already said anyone who makes these kinds of remarks has no place in Parliament or in the party. Lord Ahmed, like many of us, would prefer to believe that there is a hidden agenda, rather than a straightforward punishment being awarded for a crime. If indeed he has alleged a ‘Jewish’ lobby is against him, he might be in the same sort of league of conspiracy theorists who claim that the 9/11 attack on the twin towers was a Jewish plot to malign the Muslim community. Incidentally, Lord Ahmed had in the past also been suspended from the party for allegedly offering a $10 billion bounty for the capture of US President Barack Obama. Later he denied these allegations, and after an investigation, his suspension from the party, at that time, was revoked. So will the same thing happen again? While his alleged interview in Pakistan is being investigated, at present the danger is that many people will be willing to believe any canard if they respect the individual who is making the claim. That is why parliamentarians and those in positions of power are advised to be extra careful about what they say and do - especially those who belong to the minority community, as all Asians are in the UK. It for this reason particularly that Lord Ahmed’s words (if indeed they are found to be true) are surprising, given his background and the fact that he was even a trustee of the Joseph Interfaith Foundation meant to improve relations between the Jewish and Muslim community. He will now also have to resign from the post. Perhaps he has only done what we all do - quick to resist any kind of blame - pushing it onto people, circumstances, and even karma. Most of us would be loathe to admit that we had genuinely blundered - as that would lead to an admission of guilt. Not only do we rarely admit that we had done anything wrong, we also try to whitewash the ‘crime’ by making it sound much more insignificant than it really is, as he seems to have done. Or is it difficult for politicians to admit a mistake because that would compromise their position? The tragedy of course is that while Lord Ahmed now says he has ‘no recollection’ of ever giving that television interview - for many his suspension from the Labour Party might only serve to reinforce ‘suspicion’ that there is, exactly as he said, a prejudice against him. That is the reality of being a conspiracy theorist - you will see a conspiracy everywhere. While there is widespread outrage over Lord Ahmed’s ‘misspeaking’ , other UK MPs have been in hot water as well. Last week an ‘honourable’ MP was caught in an unseemly fight in a bar at the House of Commons. This is the second time Labour MP Eric Joyce has been in a brawl, and now he has been prohibited from buying alcohol altogether. And then the week before was the sorry sight of Chris Huhne, a former Liberal Democrat MP and minister, being convicted to eight months in prison along with his wife for trying to hide his ‘speeding’ points. So it has not exactly been a good week for British parliamentarians. Who do you think could be behind it? The French perhaps?